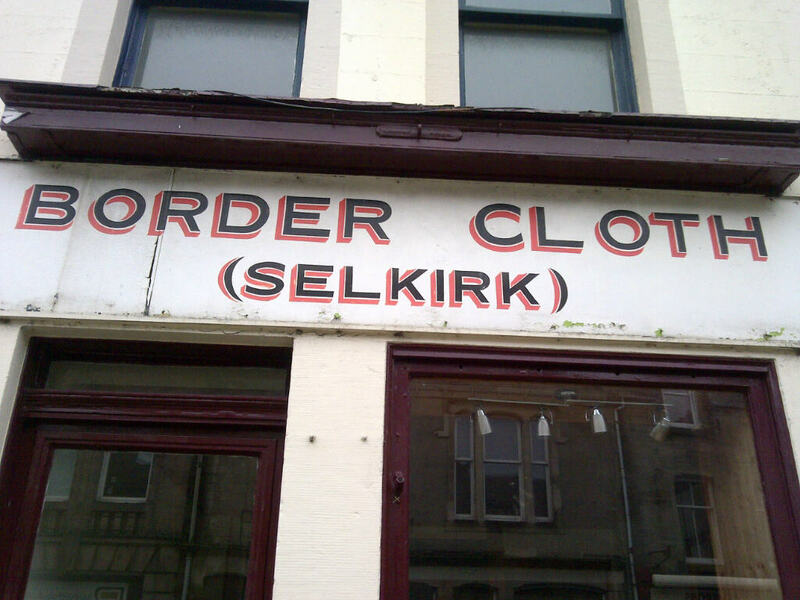 A more ‘visual’ diary of the Easter weekend when Casting the Net extended out from inland Borders town Selkirk to the coastal town of Eyemouth – there were so many good things happening it is difficult to write them all down! 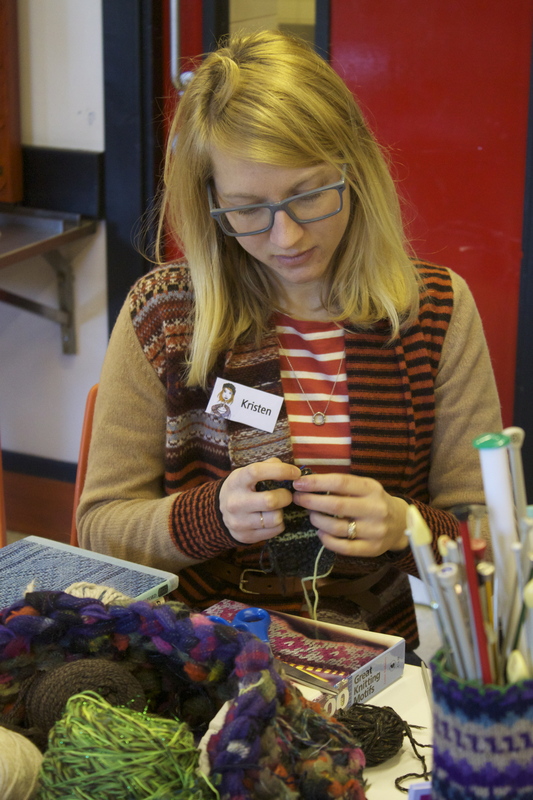 Eribé Knitwear Design headed by Rosy Eribé and her team of hand knit designers Kristen Orme and Lizzy Knowles led the ‘Knitting, knotting and netting’ event over the weekend with Eyemouth local knitter, Fay Waddell and the Eyemouth Knit and Natter group working alongside. 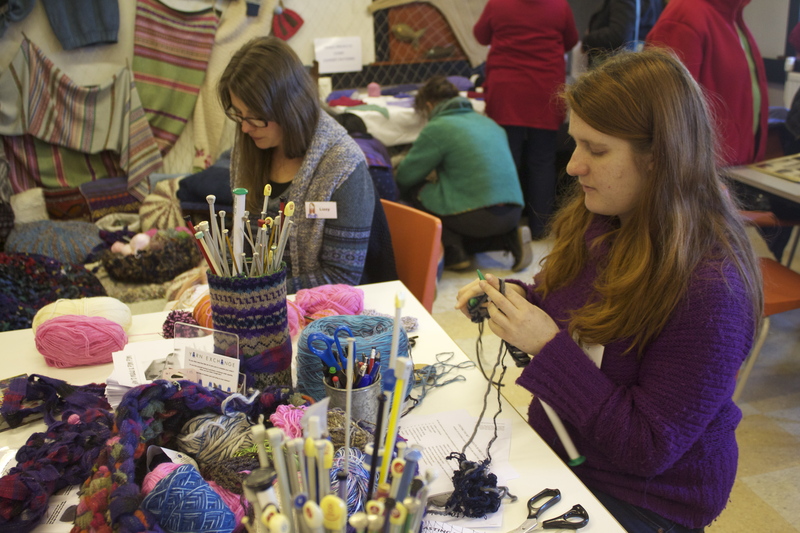 There were beautiful displays of contemporary knitwear from Eribé Knitwear Design and also some exquisitely knitted miniature samples from the local knitting group. 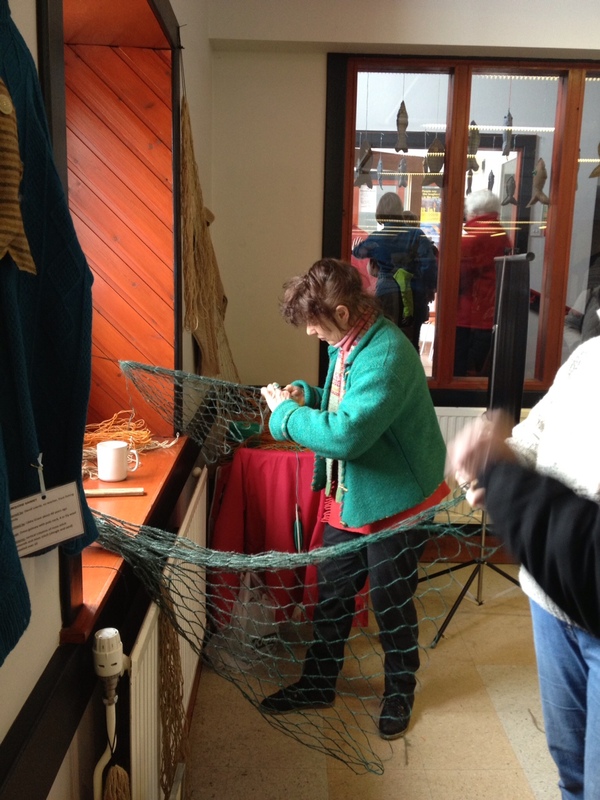 Stories were swapped and photographs of the local town and fishing community reminisced over. 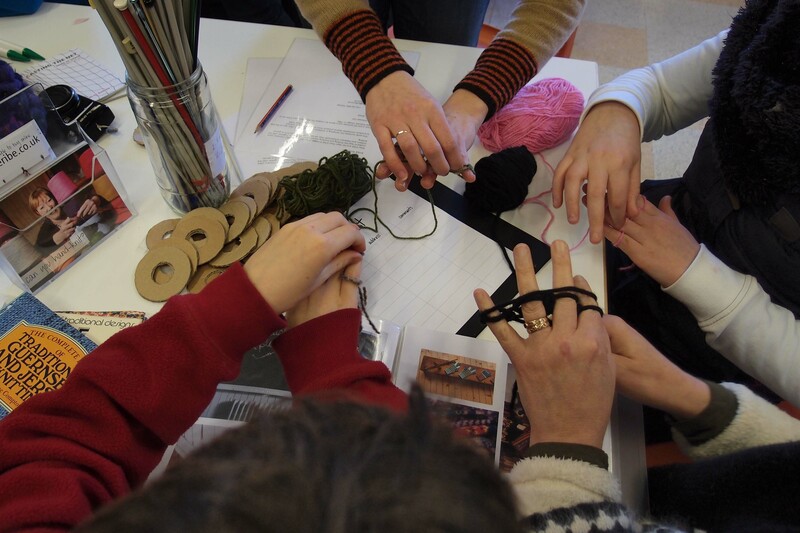 Eribé Knitwear Design led a continuous drop-in workshop in teaching knitting techniques in several clever ways (sometimes even without needles just hands!) 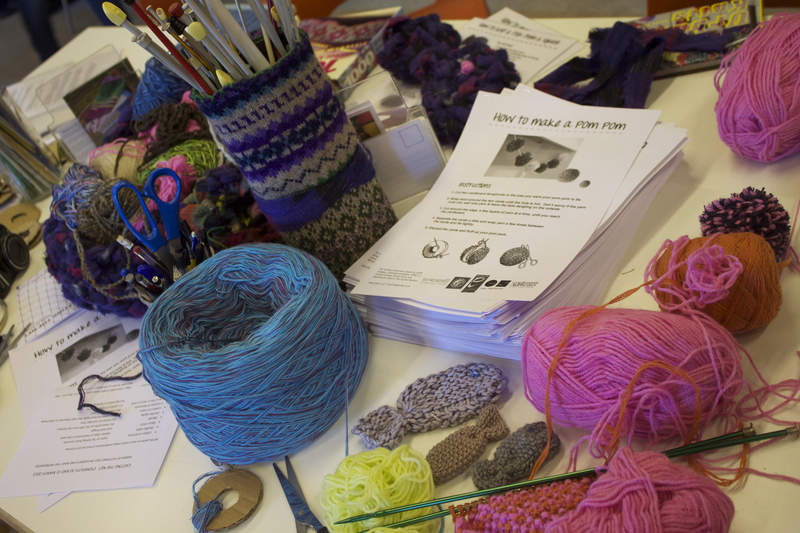 and over the weekend knitted fish, pom poms and finger knit bangles appeared as a result of the patient coaching. 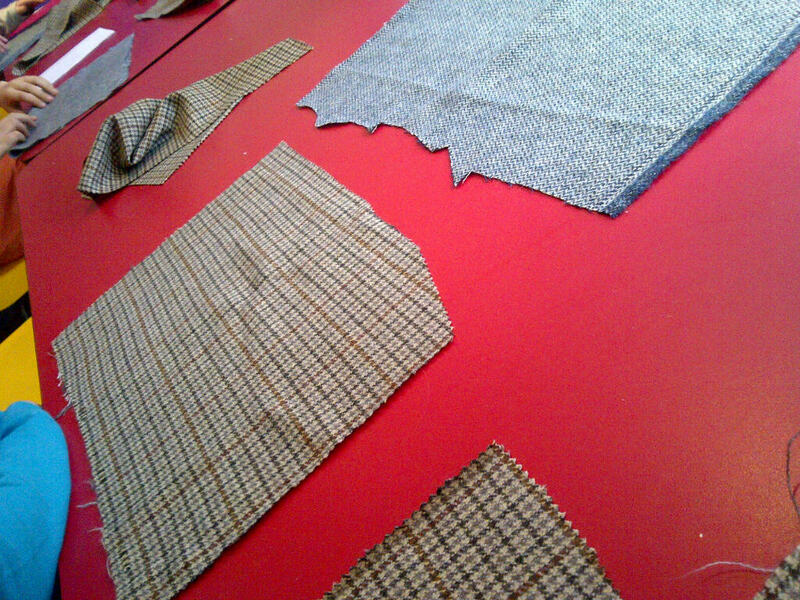 Eribé Knitwear Design were assisted by volunteers from Borders Textile College who enjoyed getting stuck into learning new techniques and exploring oversized yarn and needles. 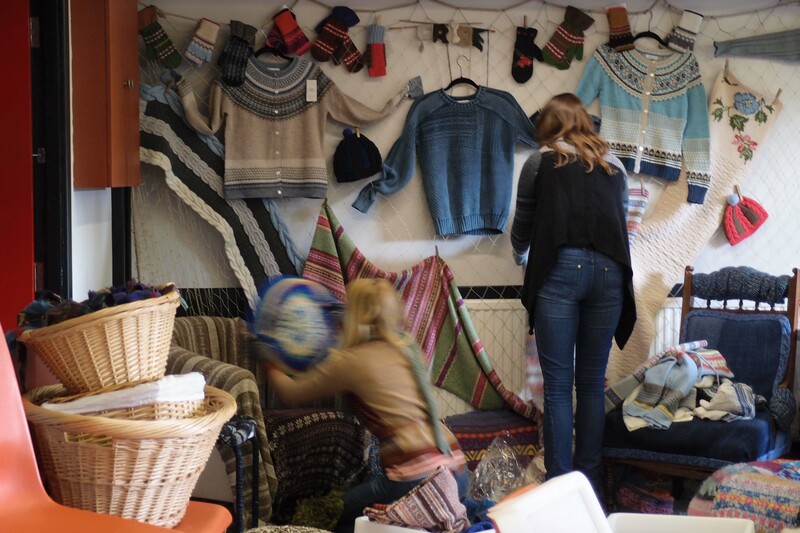 A big thank you to the Eribé Knitwear Design team led by Rosy Eribé. 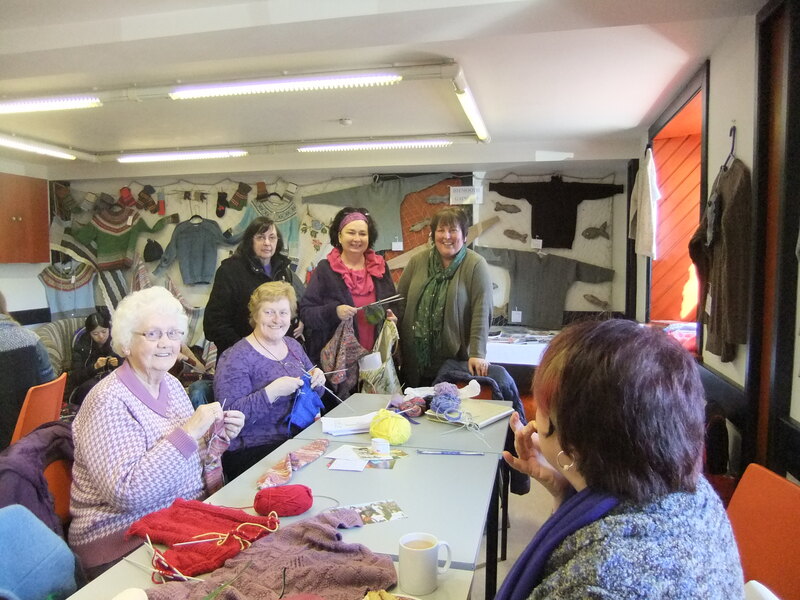 Eyemouth Knitters & Natterers with Liz Dickson who was actually knitting a Gansey on 5 needles over the weekend. 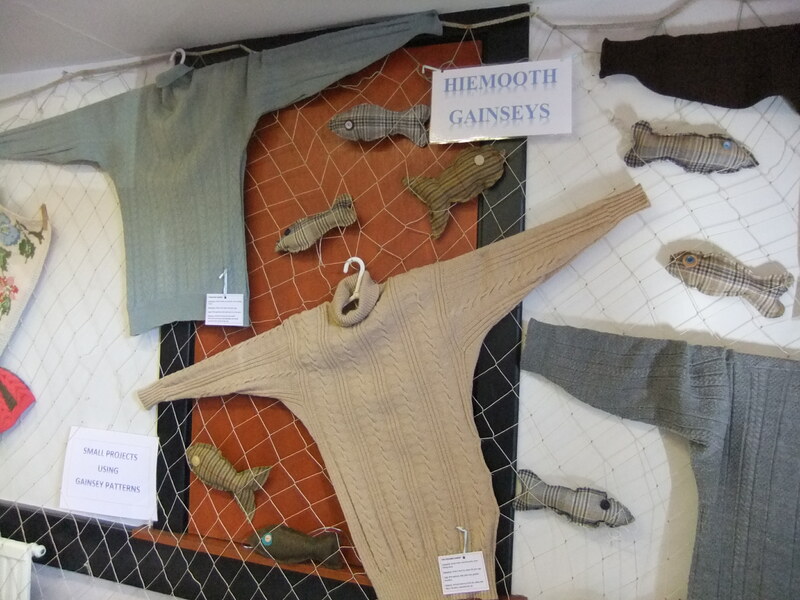 Below is a photograph from Fay Waddell showing the display of Ganseys. 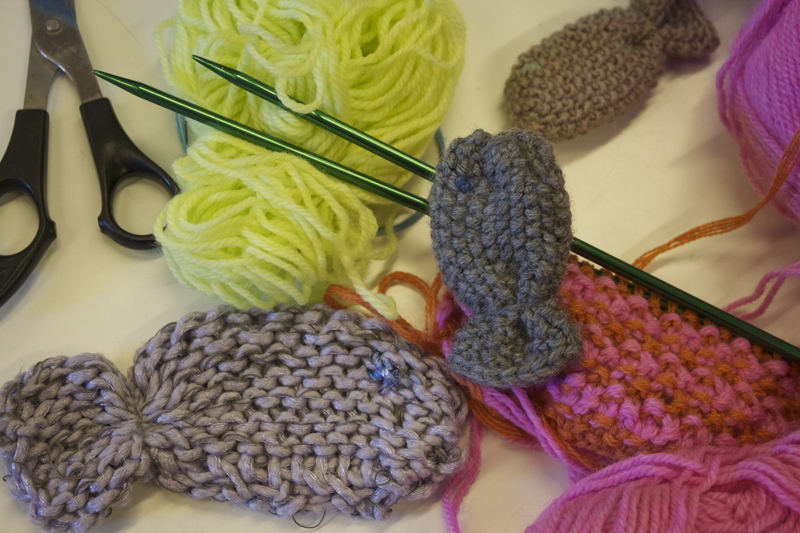 Thank you very much to the Eyemouth ‘Knit & Natter’ group led by Fay Waddell and her team of locally skilled knitters. 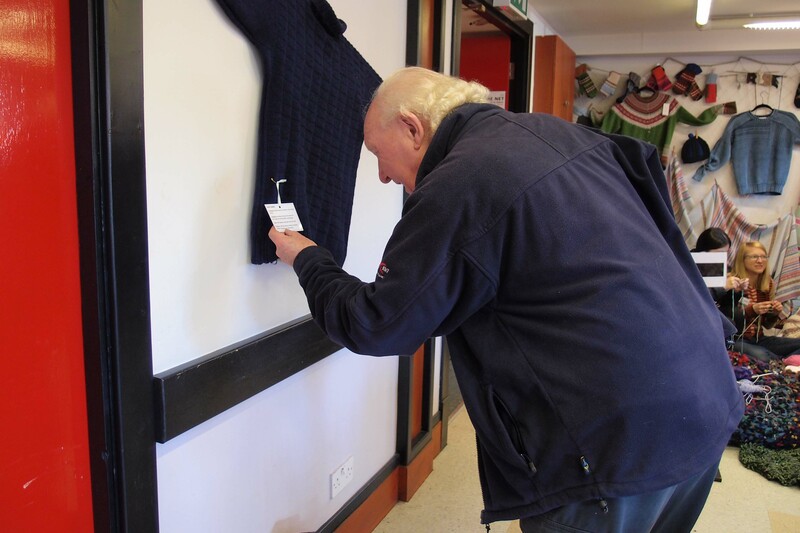 Alec Thorburn, admiring one of the Gansey’s loaned to Fay Waddell from local Eyemouth fishing families for the exhibition – each one was labelled with its own story. 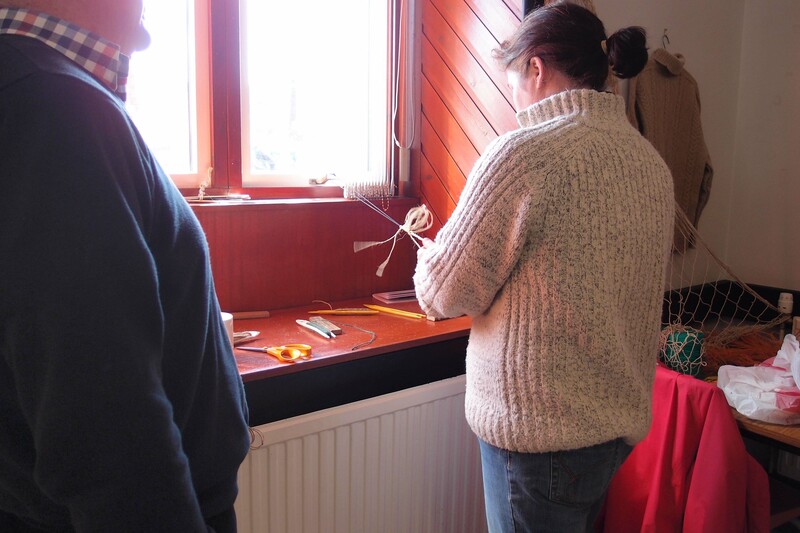 While the knitting workshops progressed local net maker Fiona Drewery (of Stuart Nets) set up her net making station and while making a net also had one for people to try out net making. 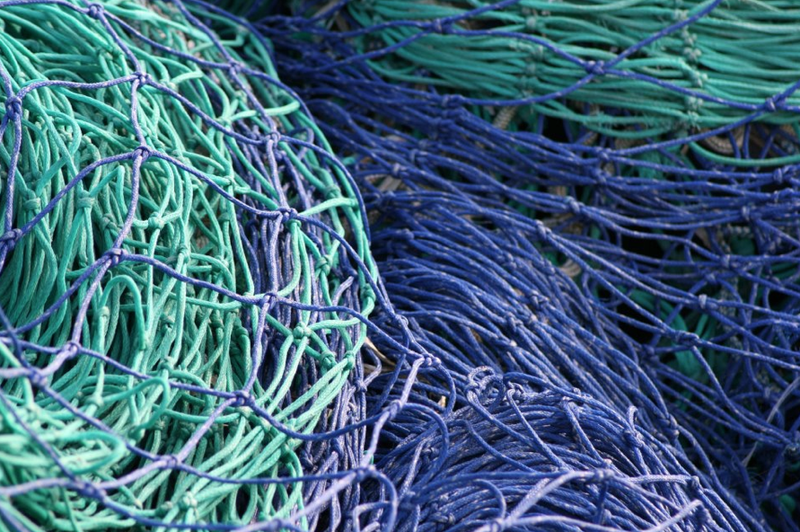 The net being made was beautifully crafted and people trying to do it began to appreciate the skills required to consistently produce an evenly made and durable net. 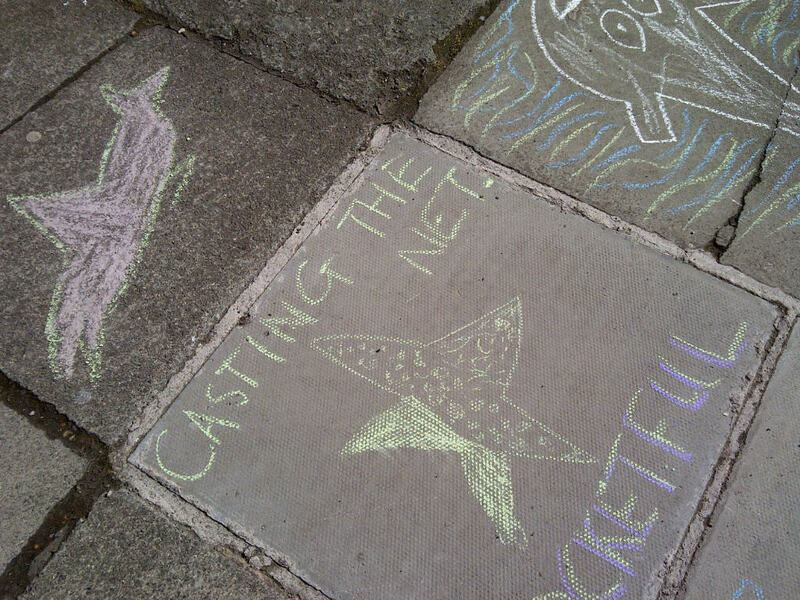 On Saturday morning Casting the Net artist, Mark Timmins led a free workshop with Eyemouth Harbour’s Pocketful Kids run by Kerry Waddell and Sophie McNeil. 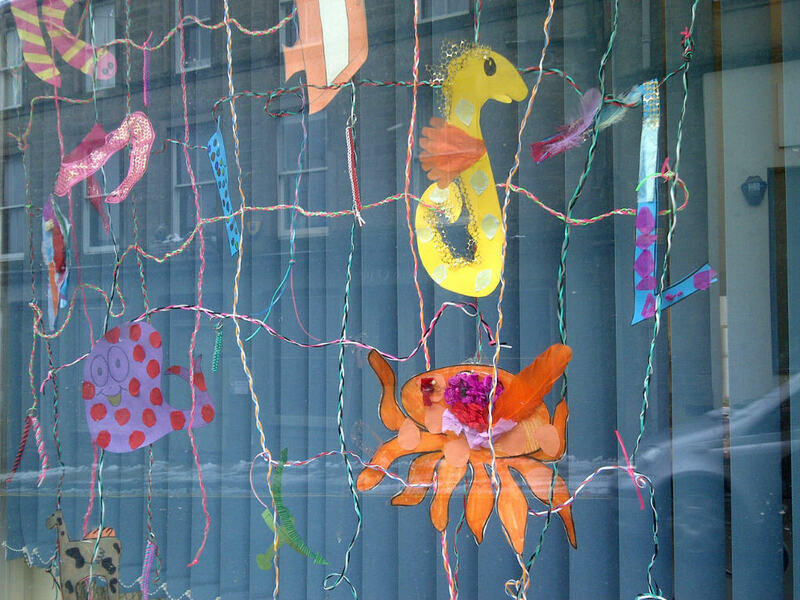 In the workshop Mark explored with the kids the relationship of knotting and weaving with the fishing nets of Eyemouth, creating with the contribution of the children, a textile and embellished tapestry, which will now be donated to Eyemouth Primary School for them to display at the end of the weekend. 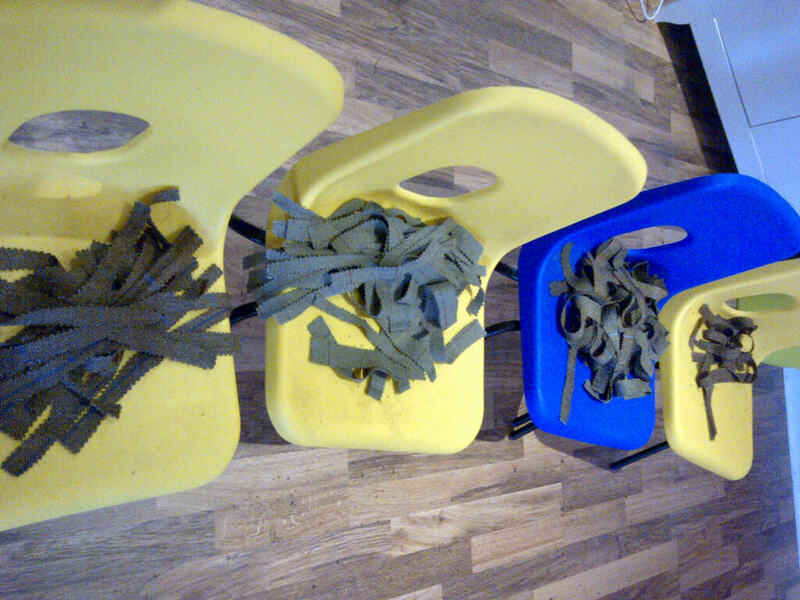 The children who went along with their parents drew, cut, knotted and wove with a large piece of fishing net and some beautiful Lovat Tweed from Selkirk. 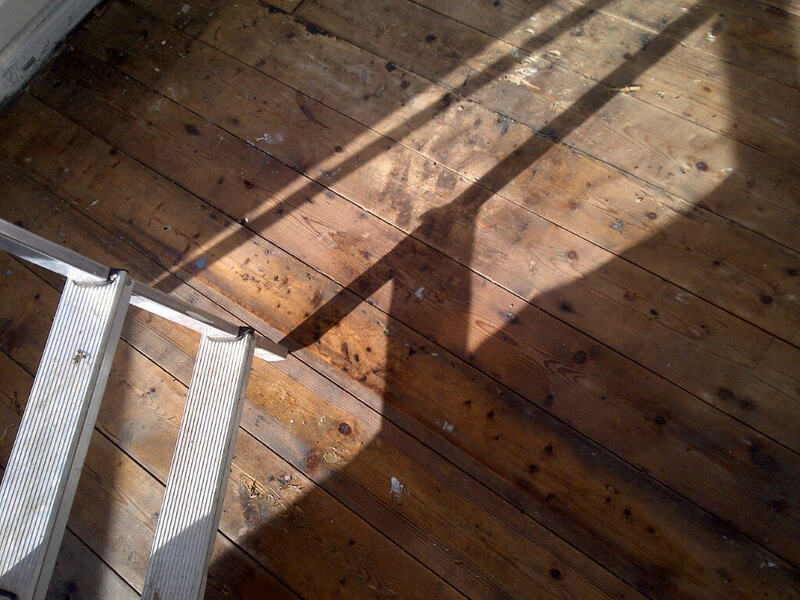 Upstairs in the Mission there was an exhibition of the work of the Casting the Net artists Sam Bain, Alice Francis, Mary Morrison, Kevin Peden and James Wyness. 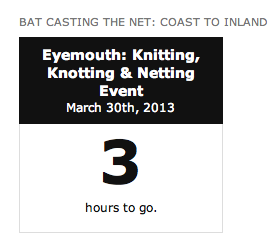 Each of the artists work related to the sea and/ or Eyemouth in very particular ways. 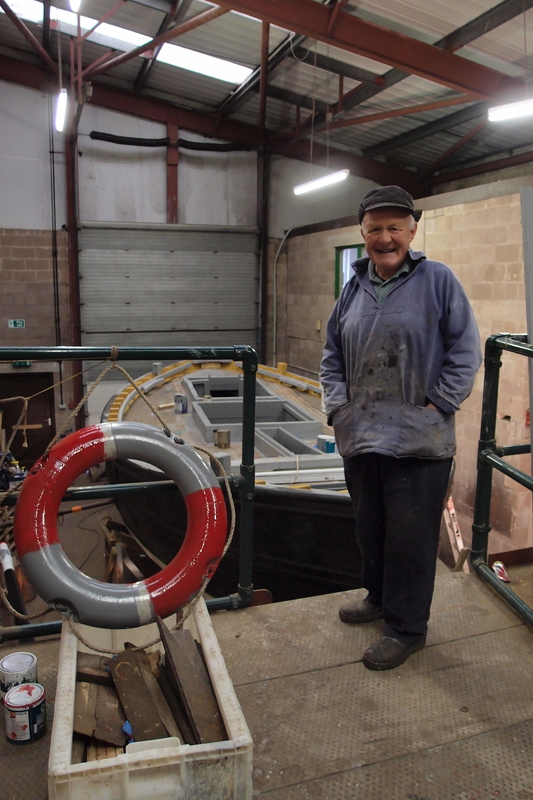 Sam Bains recent works Boatyard with Fifie, 2013 and Robina Inglis, 2013 related to her visits to Eyemouth and meeting Johnny Johnston who with his team of young people have restored an original Fifie sailing vessel. 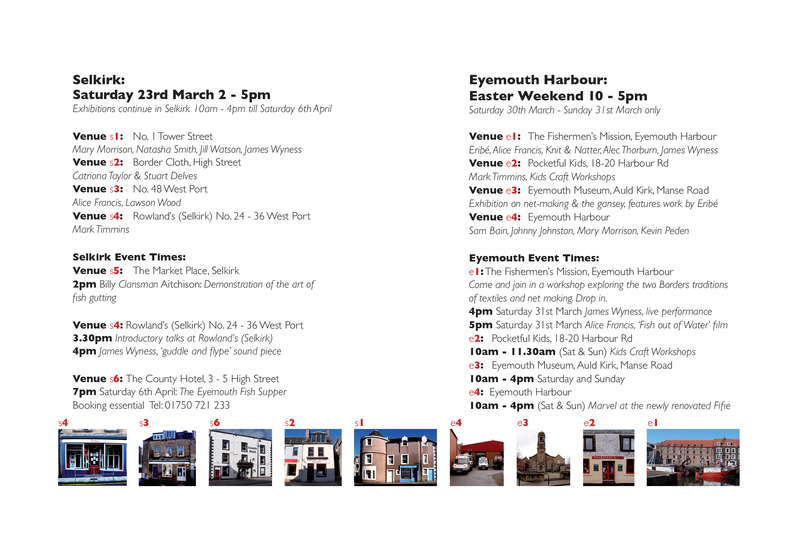 Kevin Peden and James Wyness have also been inspired by their time spent in Eyemouth Harbour but in very different ways. 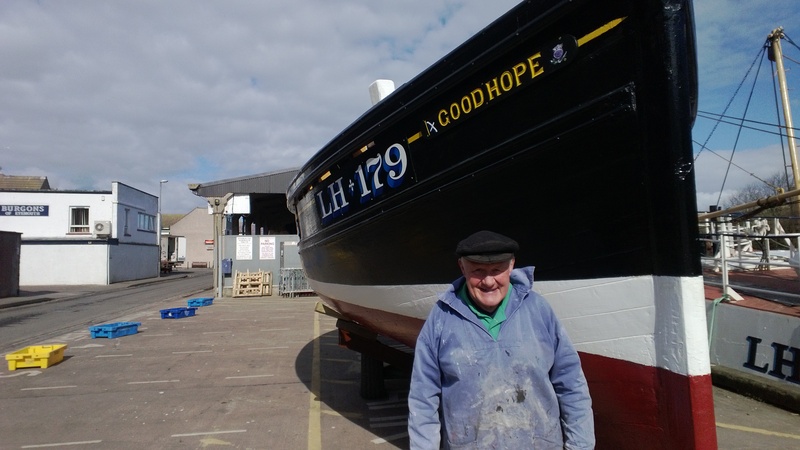 Kevin Peden set up his easel in Dickson’s Boatyard and was inspired by the work and volunteers working on the reconstruction of the Good Hope, Fifie sailing boat. 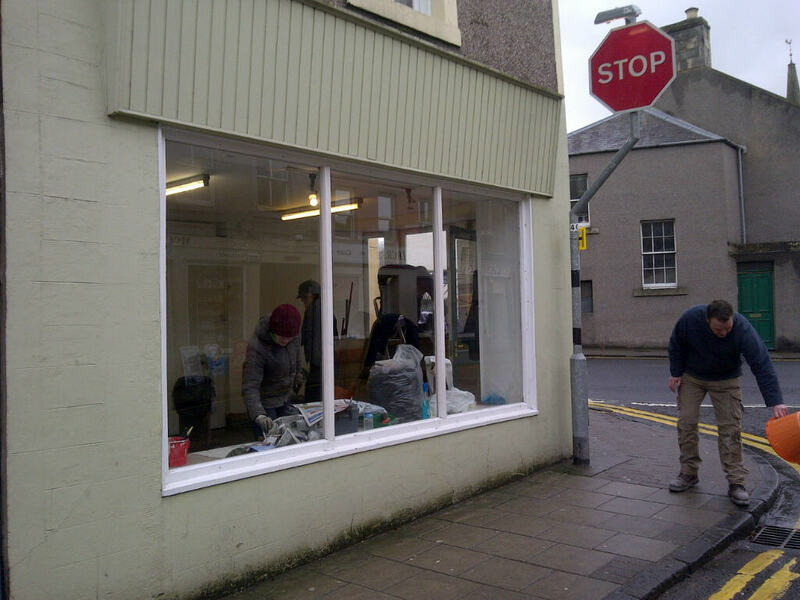 James spent his time in Eyemouth recording in the Ice House and on the fishing and sailing boats of Eyemouth, in Selkirk town square where the mobile fish van comes each week with fresh fish from Eyemouth and produced and mixed a sound piece which captured the essence of the coast and the town. 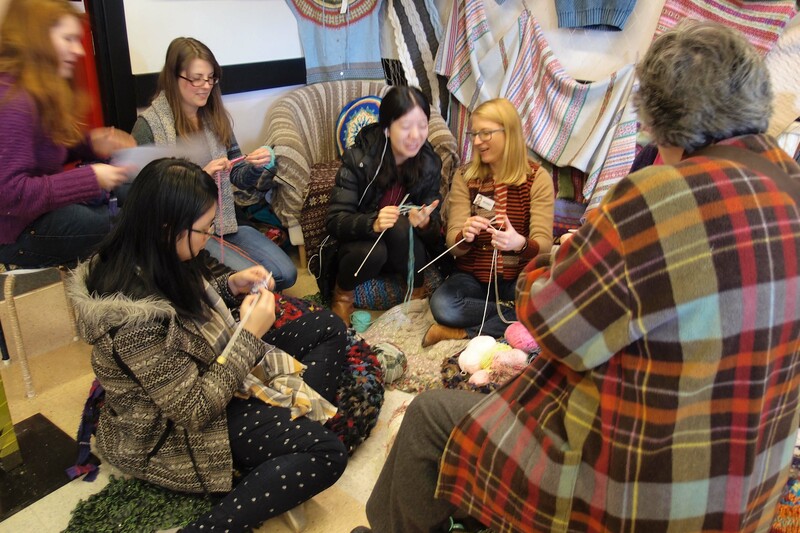 James performed live in the Mission on Saturday afternoon to a relaxed audience who were knitting, knotting and netting- absorbing the sounds recorded locally. 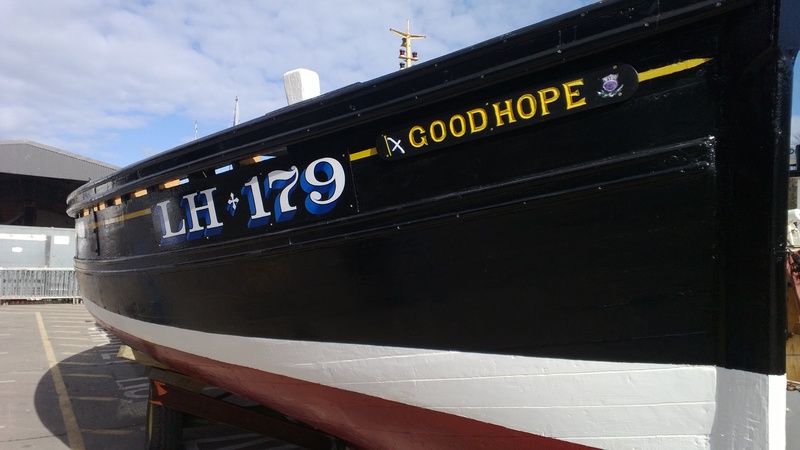 On Eyemouth Harbourside Johnny Johnston was out in the sunshine proudly showing off the beautifully restored Fifie, ‘Good Hope’, an original sailing vessel worked on by local volunteers and a group of local young people in Dickson’s Boatyard over seen by Johnny. 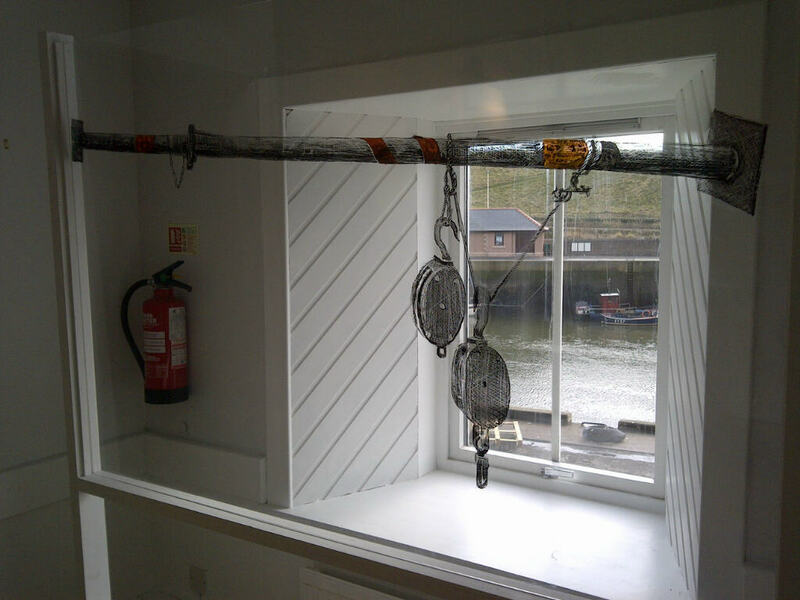 Eyemouth Museum was the final Casting the net venue in Eyemouth and they had set up a special exhibition on their first floor gallery of archive photographs of the local fishing industry, a selection of older Ganseys hung with three contemporary Ganseys made by Eribé and played a DVD about the history of the Gansey and also one made by Eribé Knitwear. 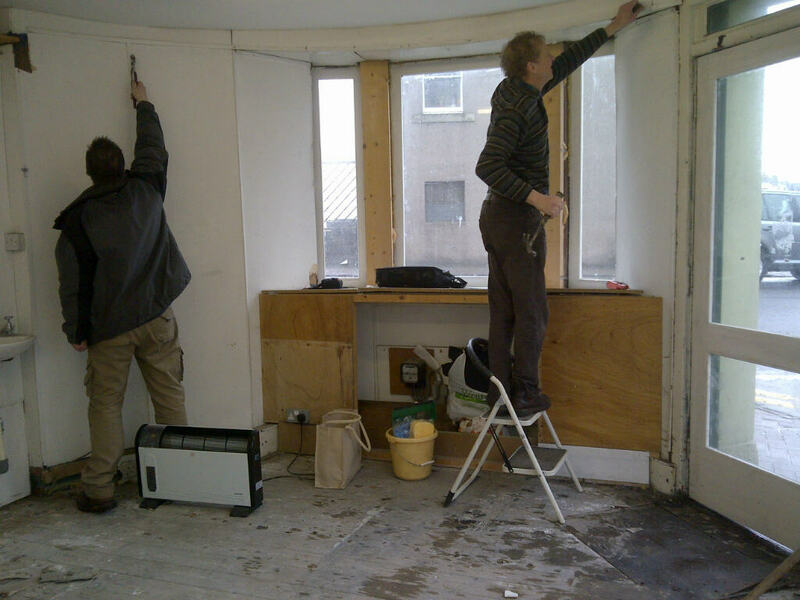 Teas, coffees and home-baking were provided in the Mission by the Eyemouth Community Trust – Anne McNeil and Sina Anderson effortlessly hosting the visitors to the workshops and exhibition upstairs in the Mission. 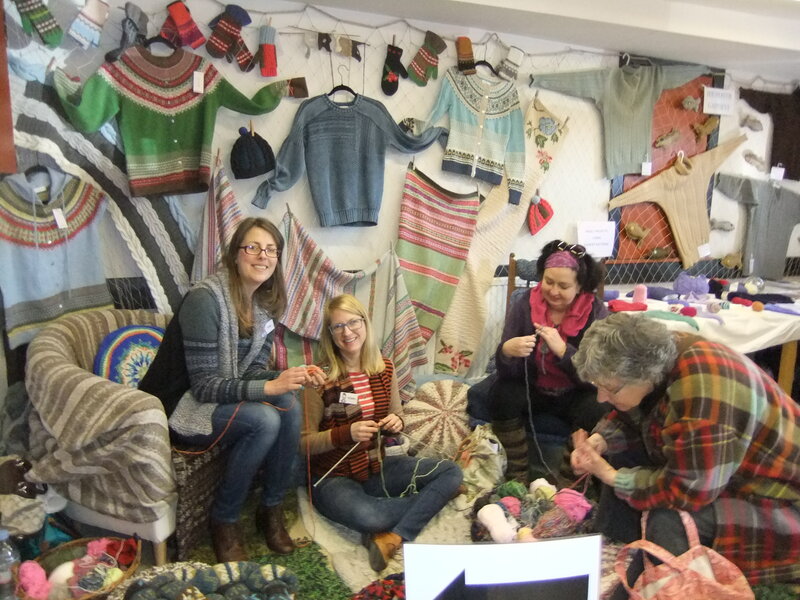 Thank you and well done to everyone involved in so many ways, friends made, skills, patterns and stories swapped – it was a lovely atmosphere and well attended. 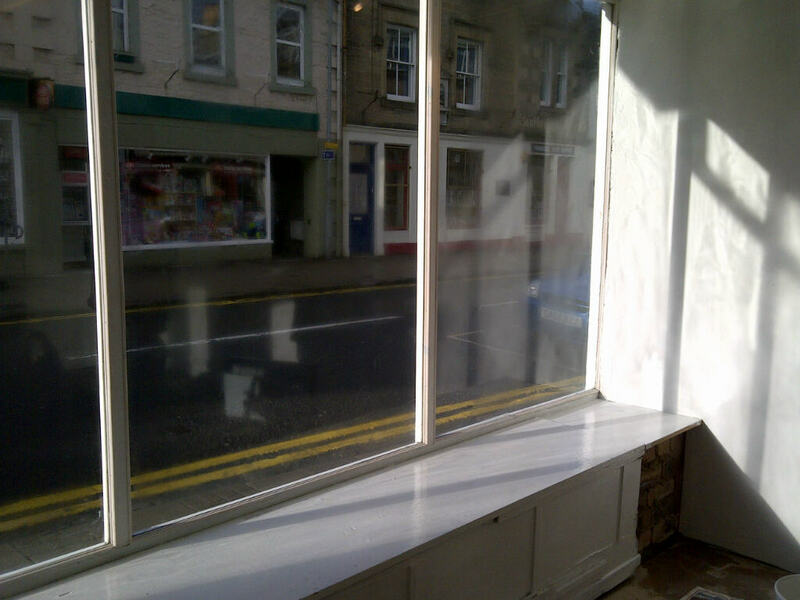 Even the sun shone for us on Saturday! 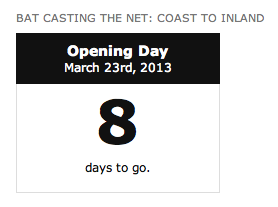 While the weather does its bitterly cold thing (!) 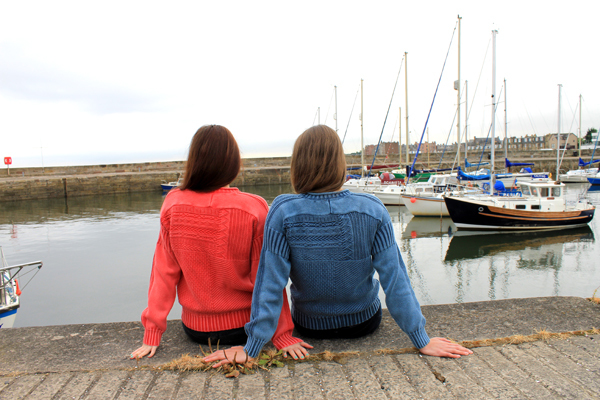 this image maybe reminds us of more balmy days by the sea in Eyemouth Harbour, enjoying the fresh salty air and kicking our shoes off and enjoying the feel of sand between our toes. 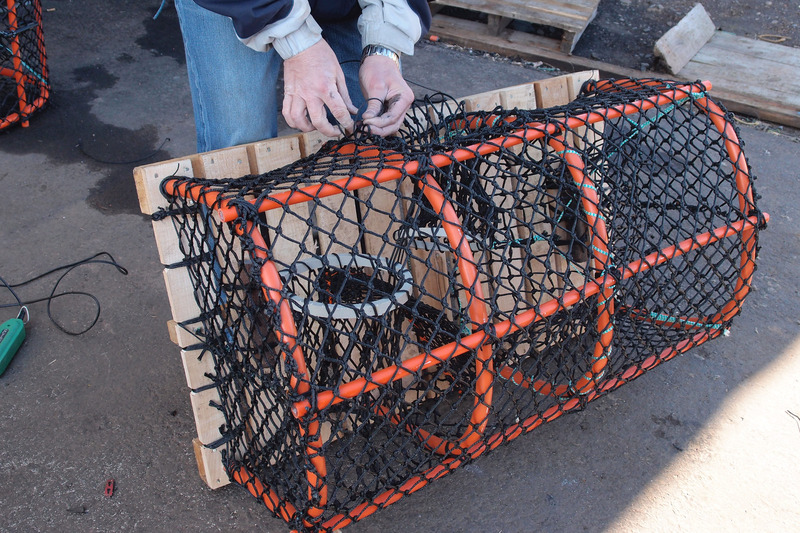 You might still be able to this if you come along to Casting the Net in Eyemouth this weekend but we can’t promise the good weather! 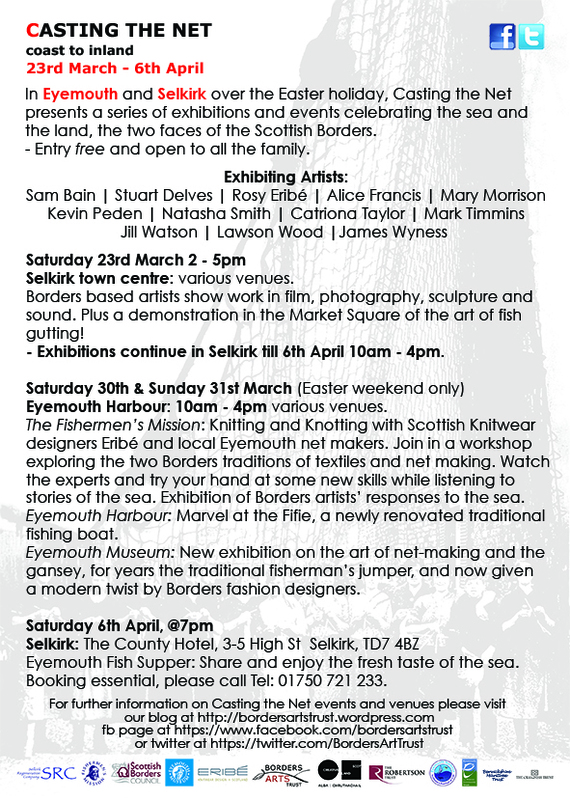 What we can promise is weekend to enjoy, something for all the family and we hope you go away having learned a new skill or gained an insight into the current and historical issues relating to the local fishing and textile industries and the connections between Eyemouth and Selkirk. 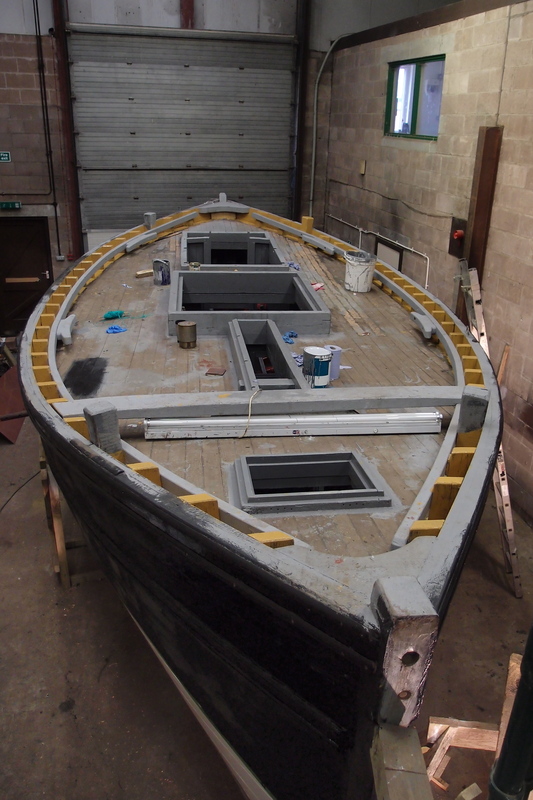 Borders Art Trust is delighted to be able to be showcasing the Fifie restoration project in the Casting the Net exhibition and you will be able to see the completed boat in the Harbour to admire the hard work that has gone into making it ‘sea-worthy’ again. 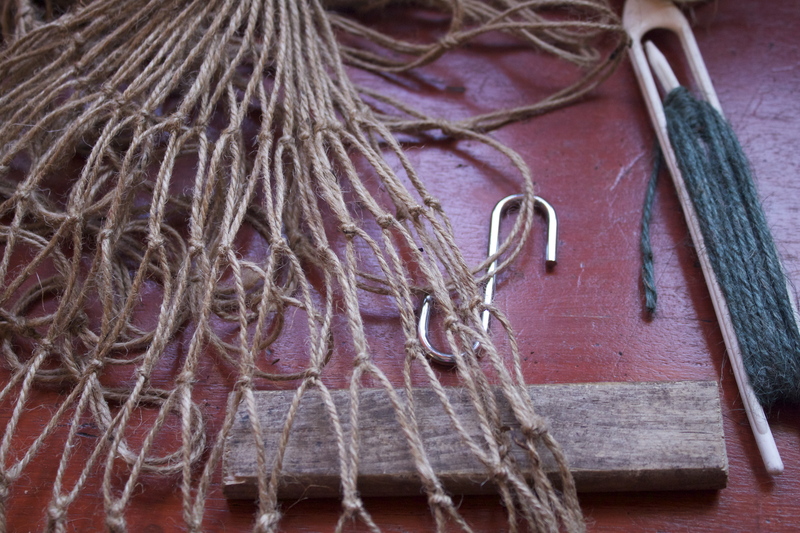 Over Easter weekend, textiles and fishing will be woven together with story, memory and song at Eyemouth’s Fisherman’s Mission. 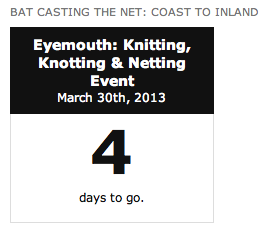 Eribé Knitwear, a successful Galashiels company are leading the ‘knitting, knotting & netting’ workshop in The Mission, Eyemouth Harbour. 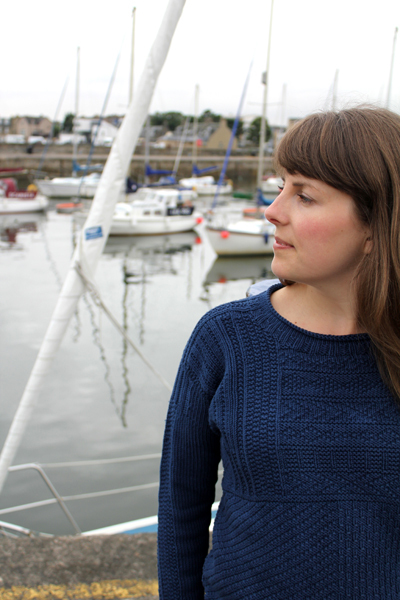 Together with the knitters, netters and natterers of Eyemouth they will take a contemporary look at gansey knitting, inspire, and in the knitting, patterns and stories will be stitched. 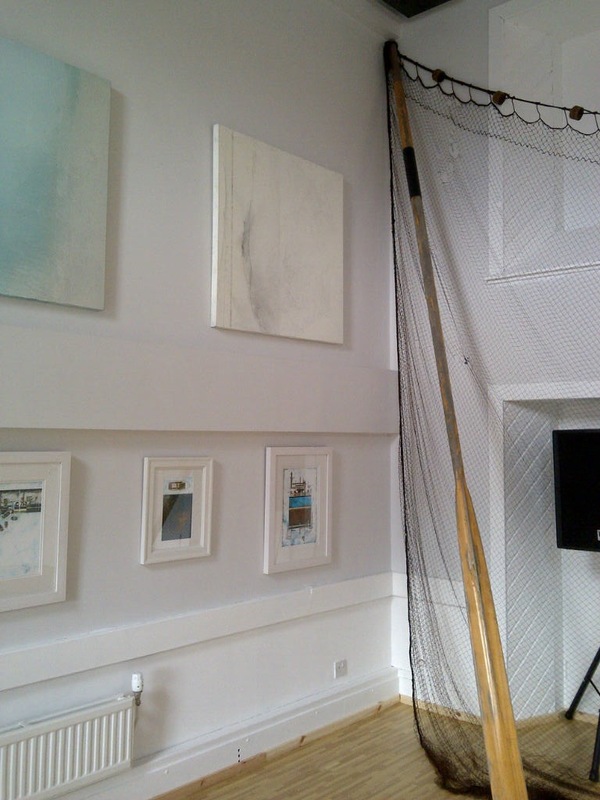 Exhibition of work by Casting the Net artists, Kevin Peden, Sam Bain and Mary Morrison. 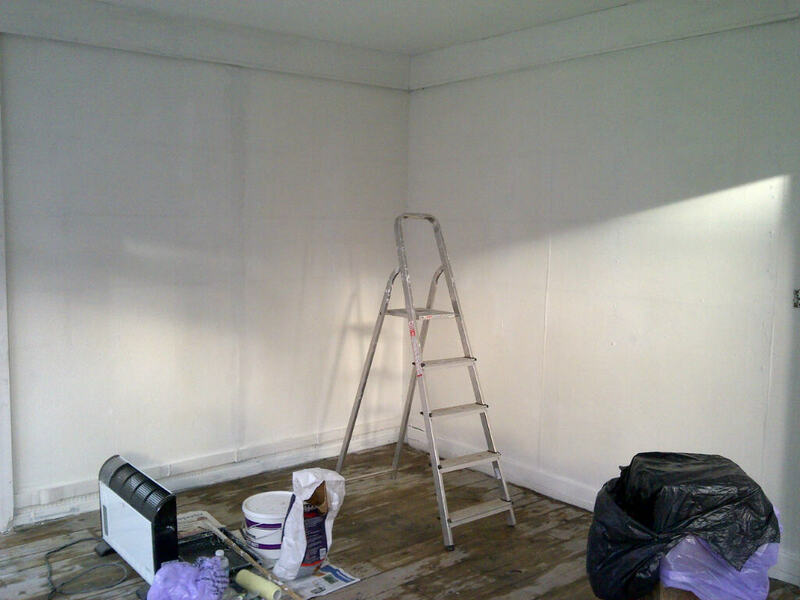 The Painting of the deck of the ‘Good Hope’ was created on the mezzanine level of the boat yard. 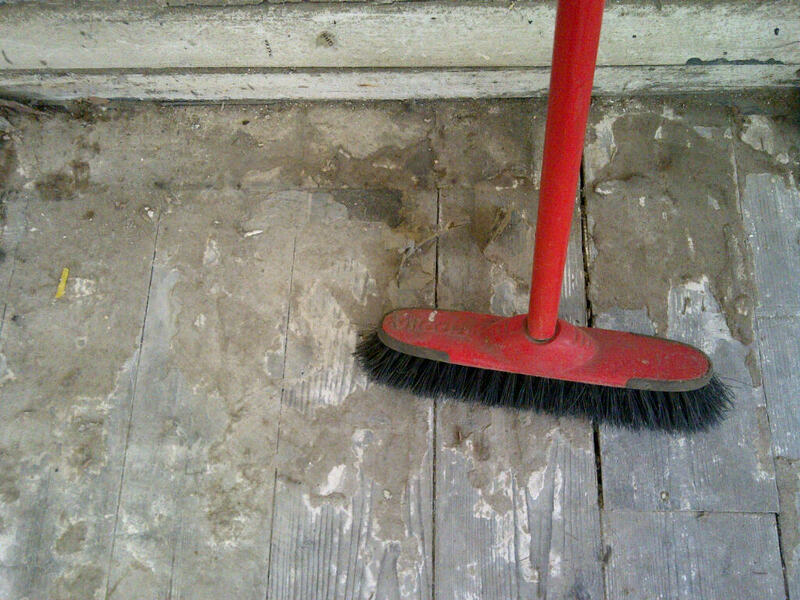 This composition was chosen to fully capture and give insight into the process and stages of the restoration. However more importantly, the composition was chosen to record the unique form of the boat. 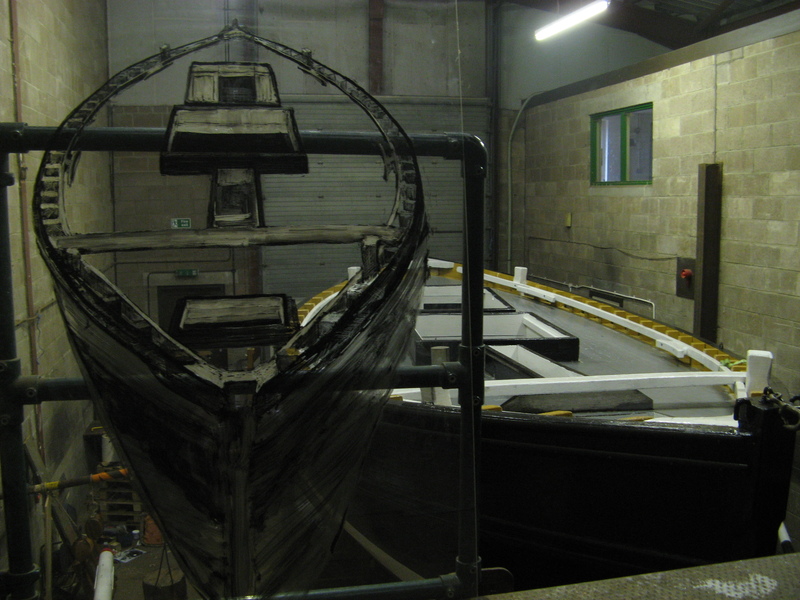 The work was completed on Perspex so the viewer could fully connect with the environment of the boat yard. 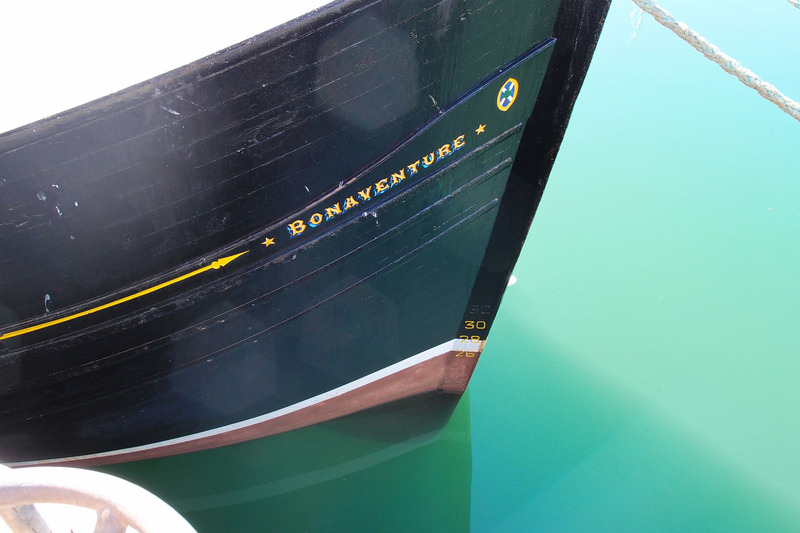 The painting was designed so that the viewer could also see the fully restored Boat in the courtyard through the transparency of the work and beyond through to the back drop of the harbour. ‘Propeller’, Acrylic Screen Print, March 2013 from Kevin’s residency will be on show in exhibition at The Mission. 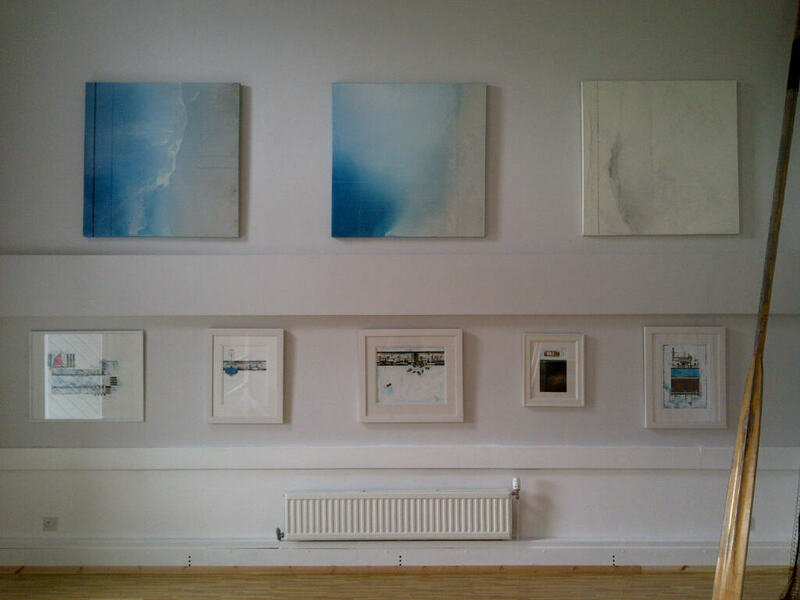 Mary Morrison’s work is largely informed by the Atlantic archipelago and combines a sense of place with layers of meaning suggested by annotation – of music, mapping, measuring. 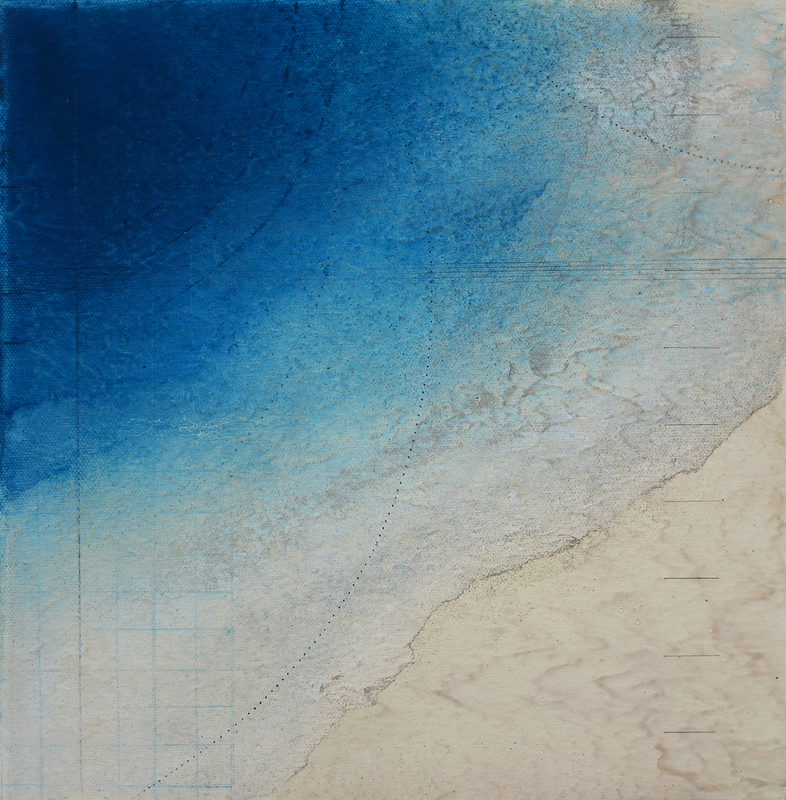 Grid references, staves, shipping charts and tide tables recur in my work, and there is often a focus on the transition between land and sea. Sam Bain draws on her interest in the world of fishing, shipping and navigation to produce work with strong nautical themes. 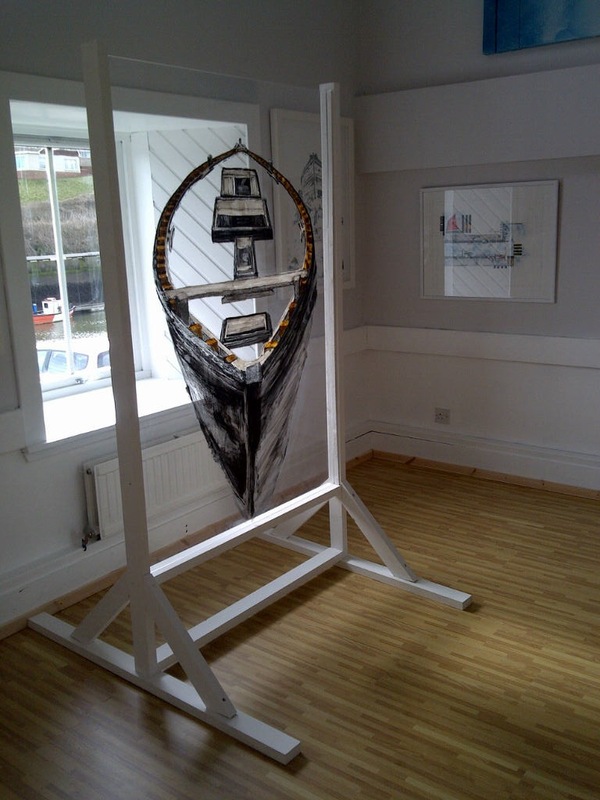 She incorporates fine detail specifications and measurements from ships, boats and harbours using them as a platform upon which to build her work. 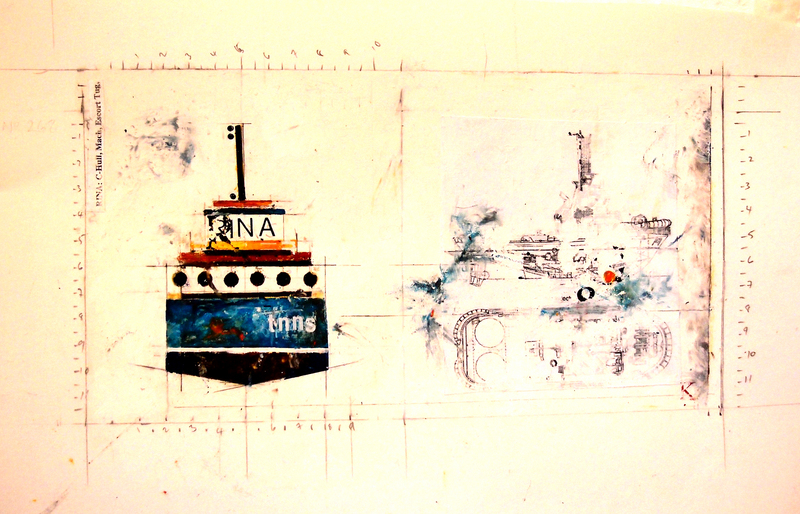 The presence of gridding and engineering shorthand in Bain’s work echoes the blueprints used in the design and production of large-scale ships. Upon this grid-work Bain builds up an image constructed from simplified, balanced geometric shapes and sparse composition. 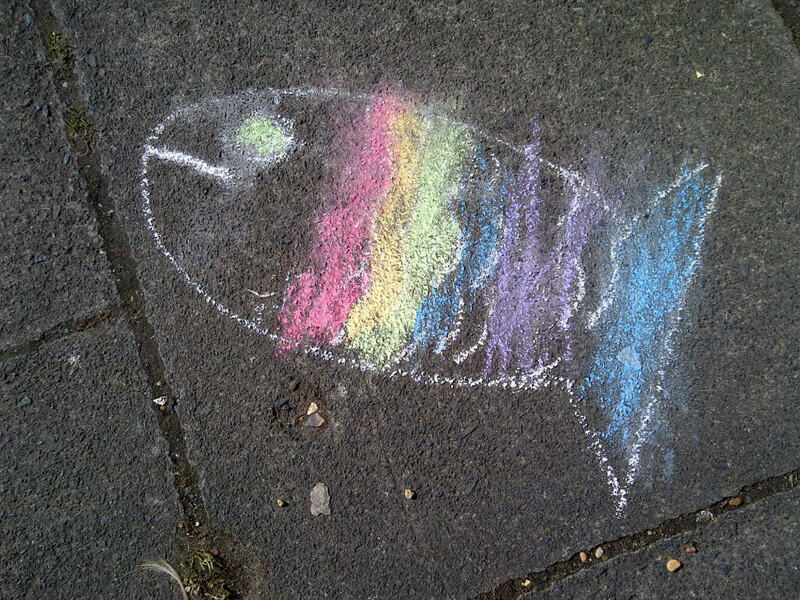 The use of oil pastel complements the use of fine details, and gives her work its texture and softness. 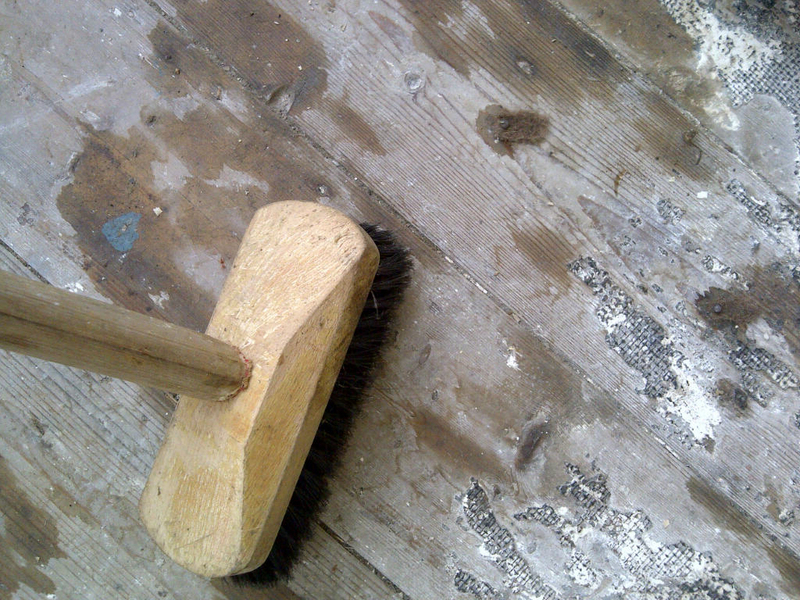 James Wyness: ‘guddle and flype’ sound piece, live performance! 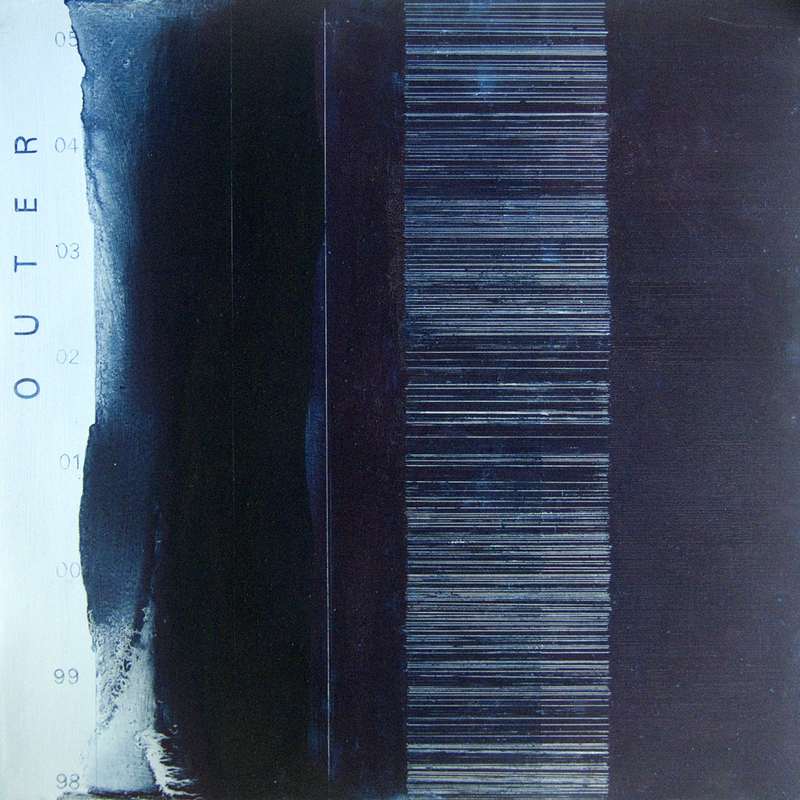 James Wyness works with instrumental, environmental and electronic sound. 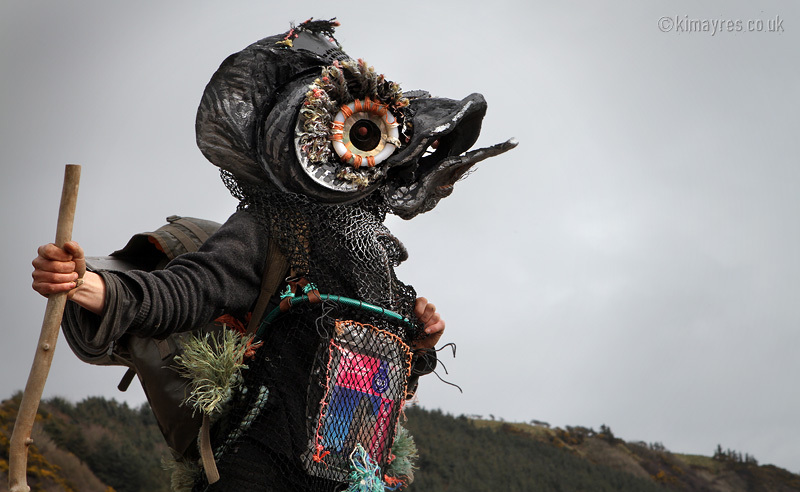 Using field and studio recordings, hand-made acoustic and electronic instruments and found objects, he creates compositions, live performances, sound installations, work for fixed media and digital publications. 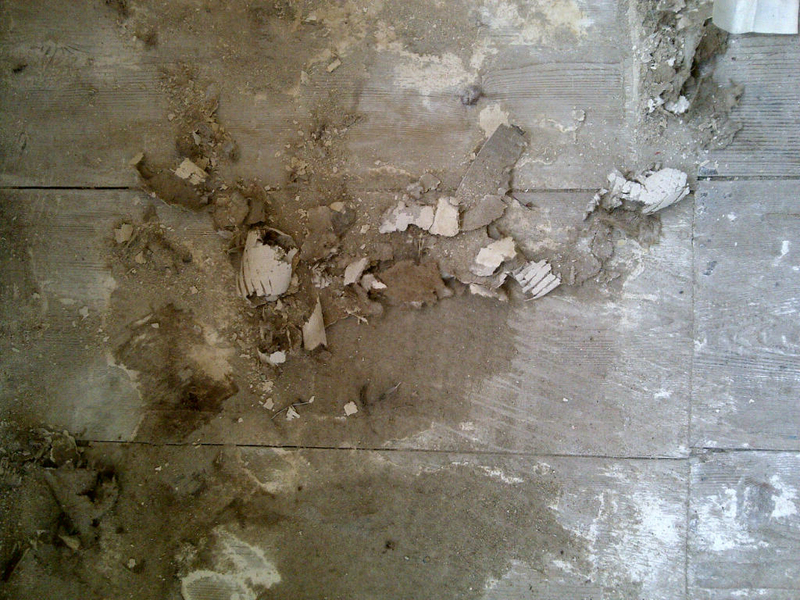 His work is currently directed towards a rigorous investigation of complexity and the materiality of sound. This includes an examination of the forms and spatial behaviours of sound in various natural and architectural listening environments. 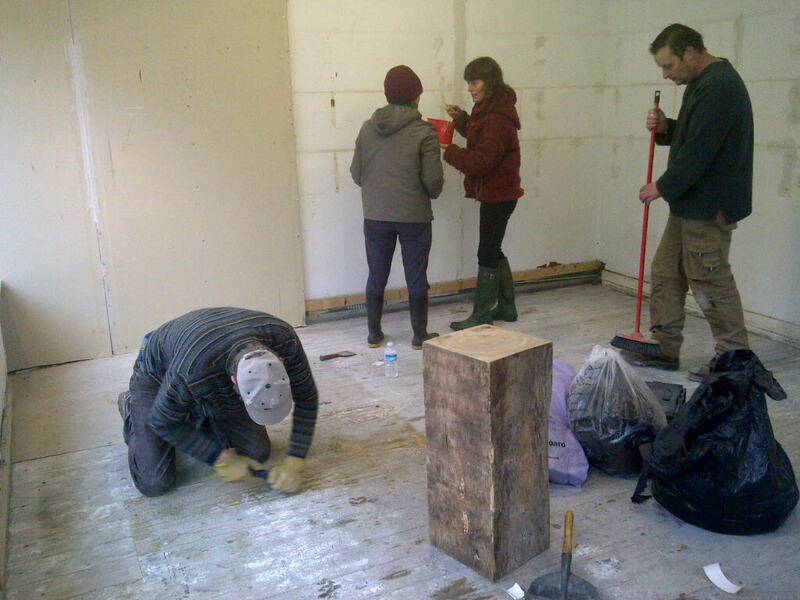 guddle and flype is a live improvised performance for processed field recordings, melting ice, hydrophones and mixing desk. 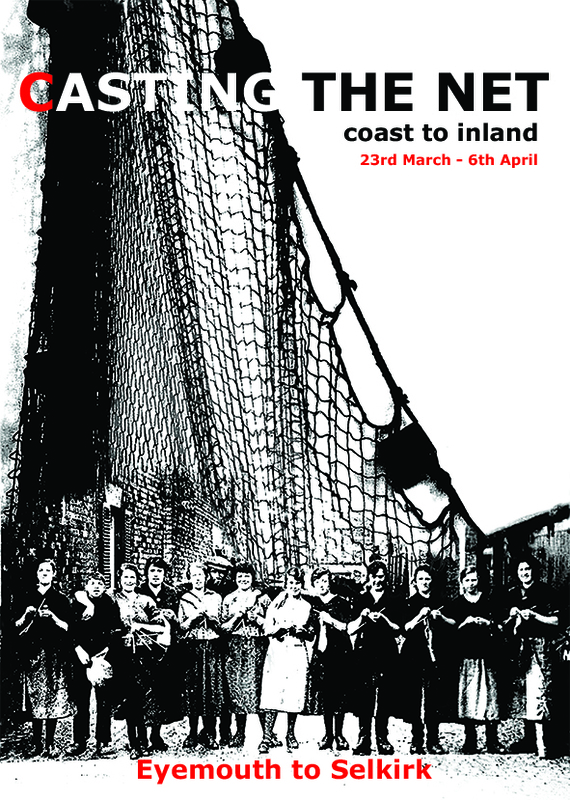 The material is derived from an investigation of specific aspects of the sonic working environment and its influence on the lives and work of men and women in the Eyemouth fishing industry and the wider seafaring community. 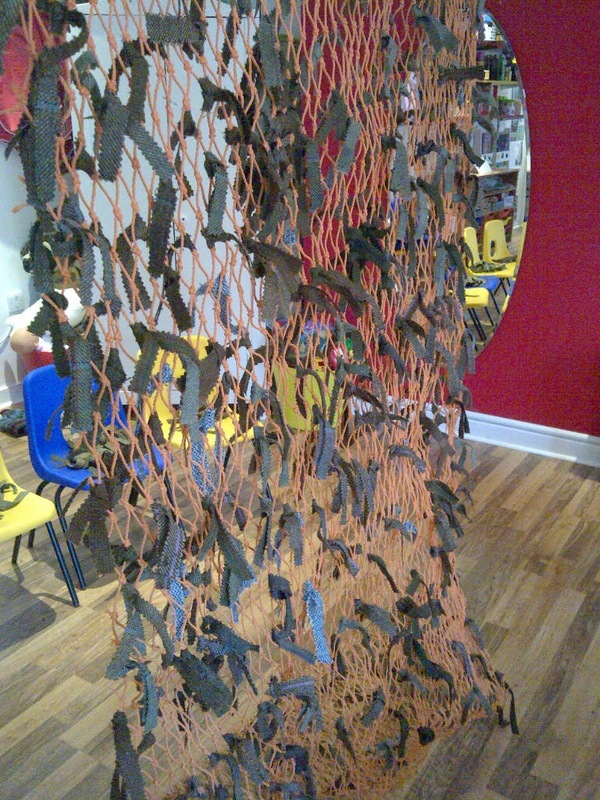 Exhibition of netting and ganseys. 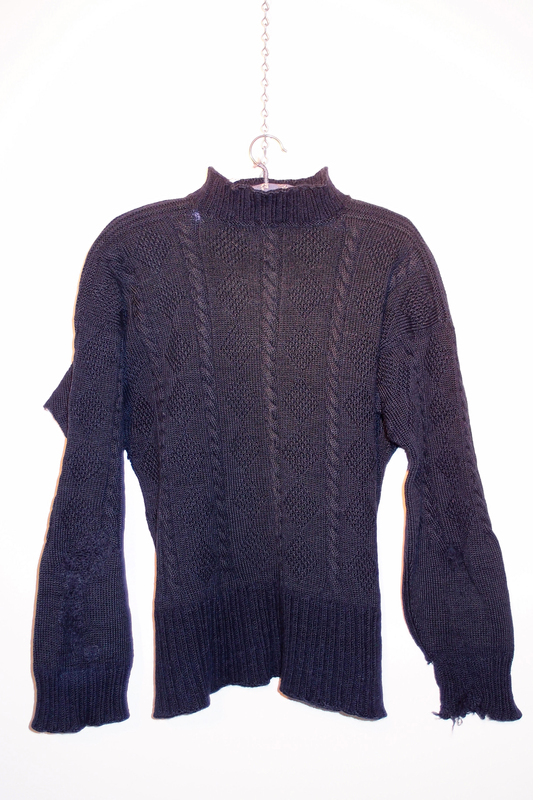 With examples of work from contemporary Gansey designers and makers Eribé Knitwear, Galashiels. Marvel at the newly renovated Fifie fishing boat, reconstructed by former Harbour Master Johnny Johnston with a group of young apprentices. 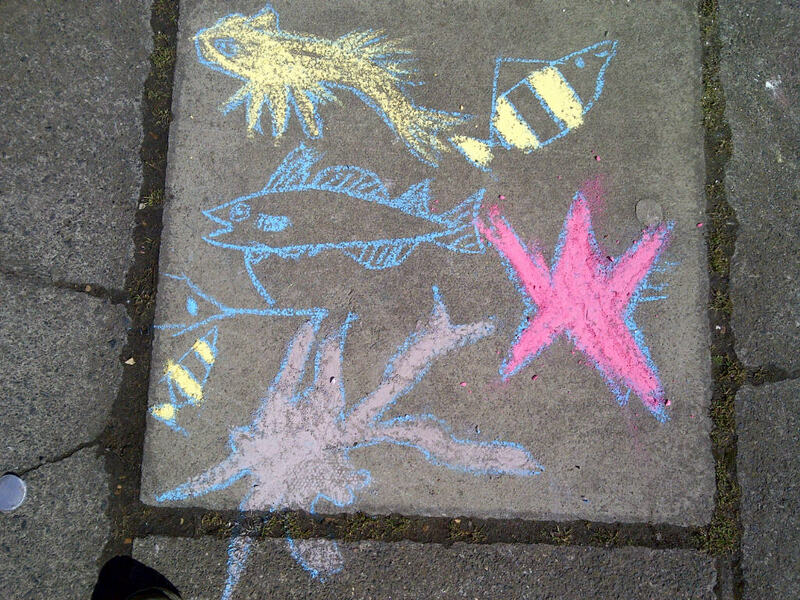 FREE kids workshop with Casting the Net artist Mark Timmins and Pocketful Kids. 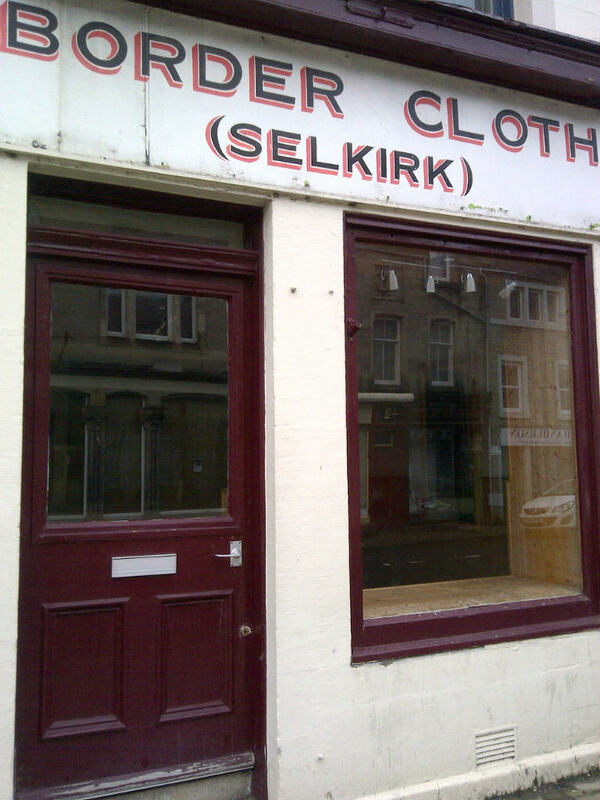 To be sure of your place please BOOK NOW, but drop-in on the day also available. 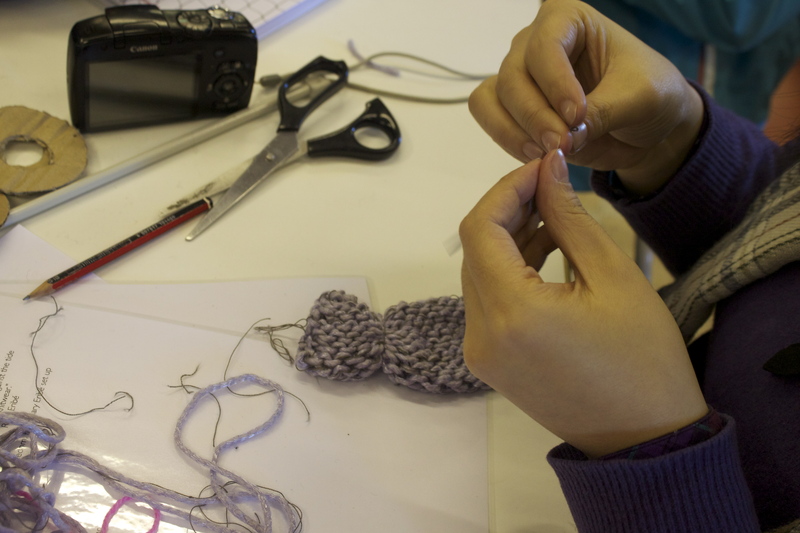 (Ages 5 – 12 yrs.). 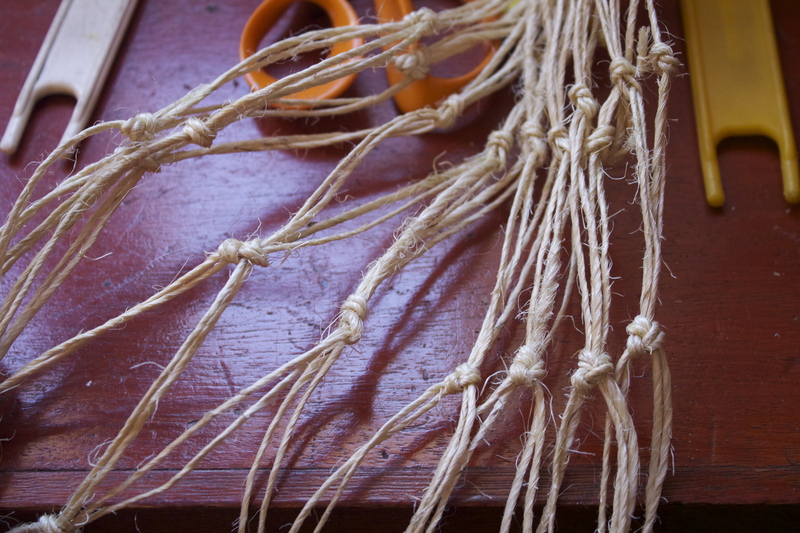 Participants at the workshop can expect to draw, cut, knot and weave with a large piece of fishing net and some beautiful woven textiles from Selkirk. 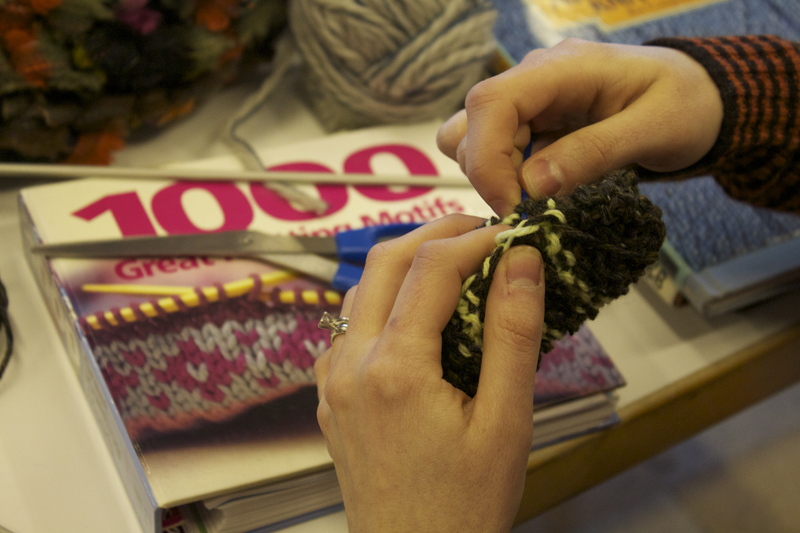 This weekend should be a great opportunity to drop in and join in, chat and exchange stories and while ‘knitting and nattering’, watching netting being made or taking part in the free Kids workshops at Pocketful working with tweed fabric donated from Lovat’s Mill that something new is passed on to future generations to preserve these timeless skills and to continue their longevity. An update from James Wyness who will be performing on the opening day – Saturday March 23rd in Selkirk at Rowland’s (Selkirk), West Port.